The blossom is stamped from the base up in this instance, otherwise the white craft ink would obliterate the other colours. So the base layer (the large stamp) is stamped in White Craft ink onto a Crumb Cake cardstock base, then stamped with two pinks or reds of your choice, using the darker shade for the smallest stamp layer. The stem is stamped in a green of your choice, and it is up to you whether you stamp the stems or the flowers first. Apologies for the slightly blurred image, it was taken at the SaleABration tour and I didn’t realise it was blurred until I uploaded it. But hopefully you still get the idea! 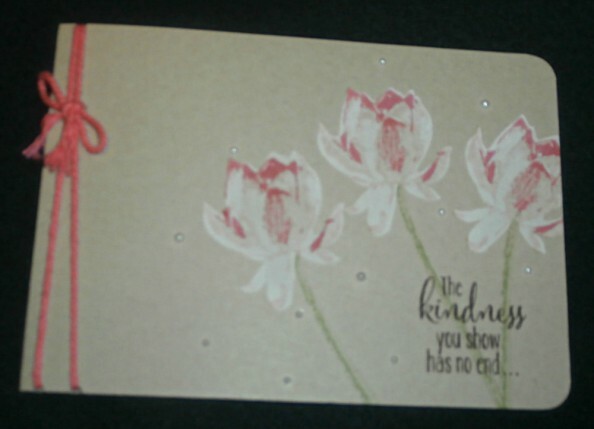 The cute sentiment comes as part of the Lotus Blossom stamp set and then the card is finished off with a few Basic Pearls and some of the new thick Bakers twine around the “spine” of the card. If you’d like a chance to try out the new Lotus Blossom stamps, then why not pop along to my Open House this Saturday? I will have this plus a lot more available for you to look at and try out if you want to, so why not drop by? There will also be some bargains to be had in the form of my retired stamp sets from the last few years, and maybe some other goodies. I hope to see you there (and don’t worry, you won’t be beseiged by three-year-olds as the twins are off to see their Grandparents for the weekend, so Gary and I will have a bit of peace and I might actually get some full-on crafty time! Goodness knows I deserve it lately! Have a great day and a fabulous weekend, and I will be back with more for you next week. Stamp Set: Lotus Blossom (SAB 2015). Colours: Crumb Cake, Strawberry Slush. Accessories: Bakers twine, White Craft ink.